What should you do if someone with Alzheimer's disease or another dementia talks about committing suicide? How should you react? What questions should you ask? What action should you take? A second study identified two other risk factors for suicide in people who have dementia: higher cognitive functioning in dementia and previous suicide attempts. The most common method of suicide (73%) was a firearm in the VA study; however, for people who were residents in facilities, firearms were less available and they were more likely to overdose on drugs, hang themselves, or jump from a height. Those who were admitted into a nursing home had a lower risk for suicide, perhaps because their disease may have progressed to a later stage and the facility provided increased supervision and presence of staff. One other study found that after dementia was diagnosed during hospitalization, the risk for suicide increased both for men and women. An awareness of the possibility of depression in people with dementia is important in preventing and responding to suicidal feelings in dementia. 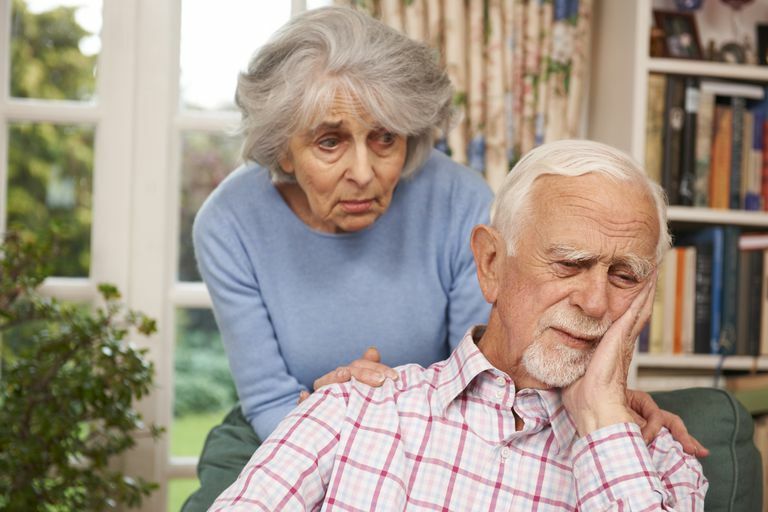 Twenty-five to fifty percent of people with dementia develop depression. Evaluating for depression, for example, through the use of the Cornell Screen for Depression in Dementia, and recognizing the symptoms of depression in dementia is very important since depression increases the risk of suicide. Treating depression, through both non-drug approaches and antidepressant medications can make a dramatic difference in the person's quality of life and reduce their suicide risk. Assess the Risk: Your first concern is for the present situation. Does this person live alone or is he a resident in a nursing home? Does he have a history of harming himself or others? Has his dementia caused him to develop poor judgment? Are his feelings more reflective of discouragement with his diagnosis, or is he actively seeking to end his life? Some people make statements about being ready to go home to heaven that don't equate to wanting to end their life. These questions and others can help you evaluate how high of a risk he has for self-harm. Determine if a Plan Has Been Developed: Ask him if he's decided on a plan to hurt himself and if so, what that plan is. Evaluate the Ability to Carry Out the Plan: A person may have a desire and have formulated a plan to die, but if he doesn't have the ability—either physical or mental—to carry out this plan, the risk is diminished. Develop a Safety Plan Together: Even though a person with Alzheimer's or another dementia may have poor short-term memory, a safety plan may still be useful. A safety plan is where you specify in writing that if the person feels he is at risk to harm himself, he will inform someone and take specific steps to prevent self-harm. Report Suicidal Thoughts to the Physician: It's very important for the individual's physician to be informed of any suicidal ideation the person may be experiencing. The doctor can then assess whether medication such as an antidepressant might be beneficial for the person and if other treatment plans need to be developed. Inform Resident Representative: If you are a non-family caregiver, be sure to report your concern about depression and suicide to the family member or other person designated as guardian or medical power of attorney. Don't assume they are aware. They may have insight into the situation and be able to help in determining the next steps. Legally, you increase your risk of fines, citations or lawsuits if you don't fully inform the resident representative about a serious, identified concern. Increase Oversight and Support: If this person is a resident in a facility such as a nursing home or assisted living center, consider setting up a system to conduct 15-minute checks on that person to verify their safety. If the person resides at home, arrange for more frequent visits by family members, home health care aides, volunteers, and clergy. If the suicide risk is high, you may need to contact a psychiatric hospital for an inpatient stay or outpatient programming. Medications and treatment plans can be adjusted there. Some hospitals have an outpatient partial hospitalization program where people come for several hours a day for a couple of weeks for support and counseling. Consider Counseling: There are often community mental health and facility services available that can provide supportive counseling to a person who is experiencing depression and/or expressing ideas about suicide. Especially in the early stages of dementia, a person may benefit from counseling services. Sometimes, you might feel helpless or just unsure of how to respond to your loved one's feelings, so it may help to remember that you don't have to do it alone. Make sure you consult with other family members, community and online resources, and other health professionals (in addition to the physician) as you work together to develop a plan to ensure the safety and improve the quality of life for your loved one. Alzheimer's & Dementia: The Journal of The Alzheimer's Association. Volume 7, Issue 6, Pages 567-573, November 2011. Predictors of suicide in patients with dementia. American Association for Geriatric Psychiatry. 16:3, March 2008, Hospital-Diagnosed Dementia and Suicide: A Longitudinal Study Using Prospective, Nationwide Register Data. Annals of Long-Term Care: Clinical Care and Aging. 2013;21(6):28-34. Challenges Associated With Managing Suicide Risk in Long-Term Care Facilities. Dementia and Geriatric Cognitive Disorders. 2002;14(2):101-3. Suicide amongst Alzheimer's disease patients: a 10-year survey. Journal of the Associations of Physicians of India. October 2011 Vol. 59. Depression in Dementia Patients: Issues and Challenges for a Physician.